Its a great Soundtrack and the Clapton with sting performance in "Its Probably me" its simply awesome and the album has another great song "Runaway Train". The Instrumentals are great and the co work of EC and David Sanborn Its great definively its a great one. 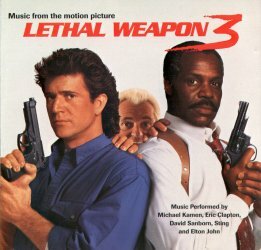 A great soundtrack, fantastic guitar from EC and great Sax playing from David Sanborn. EC plays acoustic and electric on this, great instrumentals. He and Sanborn really worked well together on this. There are 2 songs which were released as singles, 'Runaway Train' with Elton John. This is a great up tempo song with great vocals from both and wonderful solo's from Eric. The second is 'Its Probably Me' with Sting. EC plays acoustic rhythm and lead fills throughout and does a great electric solo in the middle. Fantastic bluesy song. Overall a complete soundtrack... a must for all.